BUTTE, Mont. — For years and years and years, Kim Leiter of Grand Rapids, Michigan, wondered about Capt. Robert Holton — the name on a POW-MIA bracelet she got in North Carolina in 1972 while the Vietnam War raged. She knew he went missing on Jan. 29, 1969, for the numbers 1-29-69 were also inscribed on the simple silver bracelet. But that's all she knew. She didn't know that he was an Air Force fighter pilot from Butte, Montana, or that he had been shot down over Laos during a bombing raid or if he ever made it home. Earlier this year, she called the Rock Island Arsenal, near Moline, Illinois, and someone there found a Montana Standard article saying Holton’s remains had been found, verified and returned to Butte in a hero’s welcome on July 21, 2017. She called the Standard recently, was put in touch with Holton's brother Bill in Butte, and sent her bracelet to him. As he has so many times, Bill teared up when he received the bracelet and the nice handwritten note that came with it. "I apologize for taking so long getting this to you," Leiter wrote. "I'm so sorry for your loss. It sounds like your brother was a wonderful person. I am so proud to have worn this bracelet bearing his name. "I am so glad this now belongs to you." 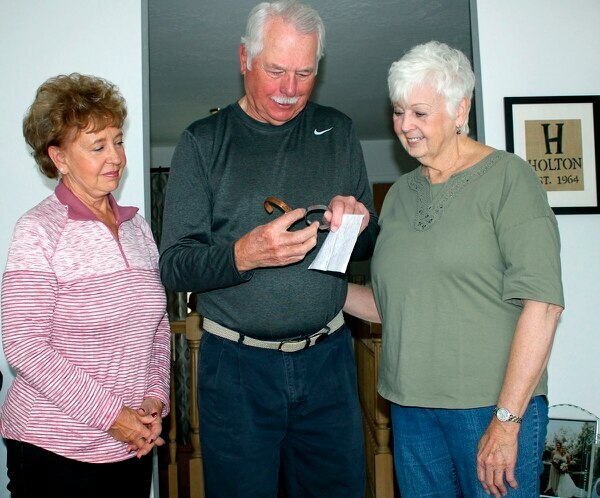 Bill and his wife, Judy, recently shared the note with the Standard and Sue MacPherson, a longtime friend of Robert Holton’s who wore a POW-MIA bracelet in his name until his remains were buried at Sunset Memorial Cemetery, west of Butte, last year. In a touching final gesture on that bittersweet day, MacPherson placed it on his casket, and it was buried with him. It was an emotional homecoming because, for decades, nobody knew for sure what had happened to Capt. Holton. The Air Force knew his plane had been shot down near the Ho Chi Minh Trail on that January day in 1969, and the military presumed him dead starting in 1972. But it wasn't until remains were excavated at a crash site in Laos in January 2017 and verified later that June as those of Capt. Holton that his brother Bill and others knew his fate for sure. 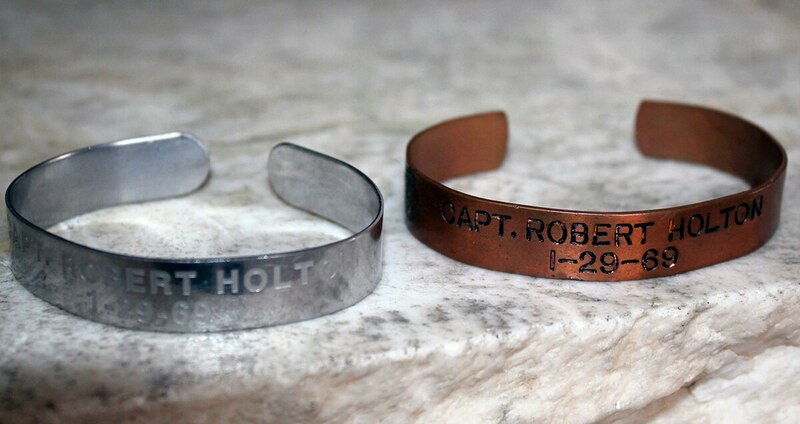 For years in between, people sent their Holton POW-MIA bracelets to the captain's father, Ed Holton. When he died on June 9, 2015, at age 97, he probably had 20 to 25 of them, Bill said. It was exactly two years to the day after Ed Holton passed away that the military called Bill and Judy and said the remains were indeed those of Capt. Holton. But the bracelets keep coming. “We have probably gotten 10 since he was repatriated,” Judy told The Montana Standard. They tear up each and every time. "After 48 years, you'd think we would be over this, the emotion," Bill said. "This is the most emotional thing that has ever happened to us." MacPherson got one recently, too, from a Vietnam veteran in Delaware who bought it at a flea market, did a little research and found her name in a story about the captain. It was a copper one — relatively rare since most were silver — and MacPherson gave it to Bill and Judy to go along with the recent bracelet from Leiter in Michigan. The Delaware man, Dennis Hugues, had messaged MacPherson via Facebook. "Being a Vietnam veteran myself, I searched Capt. Holton and found you," Hugues said in his message. "I was hoping he was a POW and made it back to the world. My condolences to the family. "The captain was my brother, and I would be happy to send the bracelet any place you would like." Not everyone has followed through, but that can be a good thing, too. Bill said he talked to a woman about a year ago who planned to send him her bracelet. He told her all about his brother and said if she sent it, he would place it at the Vietnam Memorial underneath Bob's name the next time he went to Washington D.C.
"I don't think it was a day later that she called back and said she had decided to keep wearing it," Bill said. Leiter talked to Bill and learned all about Bob before sending her bracelet to Montana.